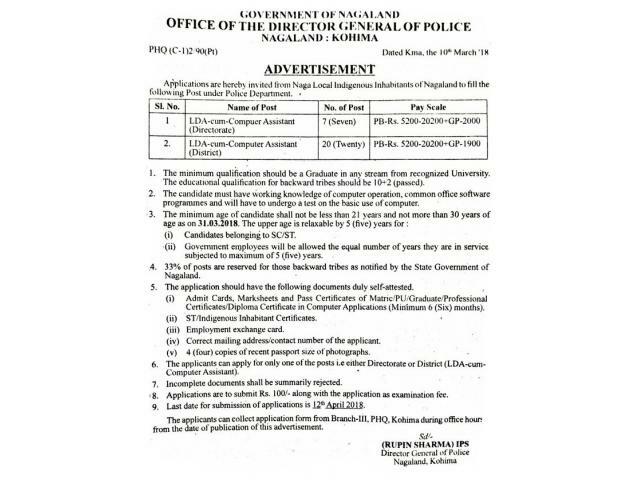 The Office of the Director General of Police, Kohima, Nagaland invites applications from Naga Local Indigenous Inhabitants of Nagaland for filling the following posts as advertised in local dalies on 13 March 2018. Candidates can apply for only one of the posts either Directorate or District. The minimum qualiﬁcation should be a Graduate in any stream from recognized University. For applicants from backward tribes:10+2 (passed). Candidate must have working knowledge of computer operation, common ofﬁce soﬁware programmes and will have to undergo a test on the basic use of computer. (i) Candidates belonging to SC/ST. (ii) Government employees will be allowed the equal number of years they are in service subjected to maximum of 5 (ﬁve) years. 33% of posts are reserved for those backward tribes as notiﬁed by the State Government of Nagaland. (i) Admit Cards, Markslieets and Pass Certiﬁcates of Matric/PU/Graduate/Professional Certiﬁcates/Diploma Certiﬁcate in Computer Applications (Minimum 6 (Six) months). Application form can be collected in person from Branch-Ill, PHQ. Kohima during oﬁice hours. PS: Shared by EADSERVE. Refer to original advertisement in local dalies published on 13 MArch 2018.